I think my local had a jar of the things like a weird lava lamp type thing ever since the place first opened. 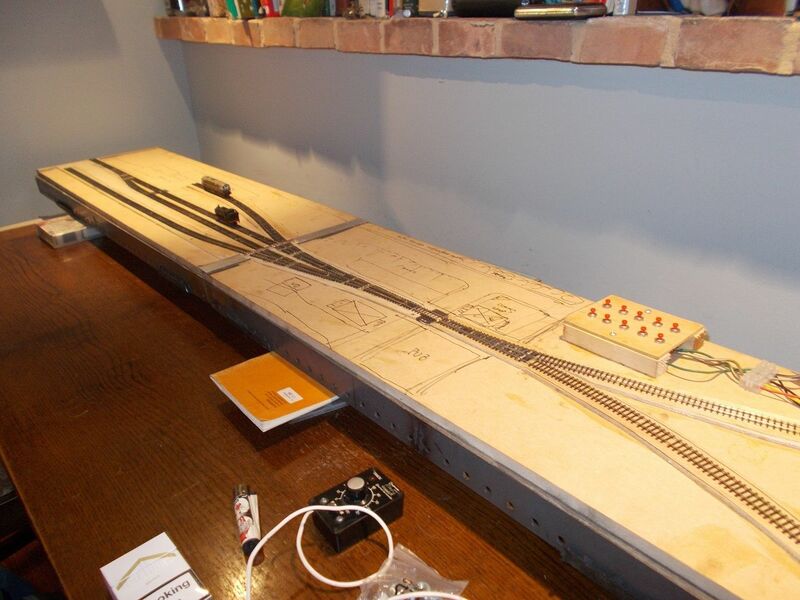 Just finishing off the electrics, and I have realised I will need to raise the boards about an inch off the dining table to clear the connectors between the two. Basically I need a length of 2 x 1 and the nearest DIY store is 15 miles away. Now eyeing up various bits of wood around the house. The garden shed roof looks a promising source of material, but it's a rented cottage... I may finish the evening with fewer dining chairs than I started with. I still haven't worked out why I have a short on the cattle dock road, it all looks fine to me. live frogs, I should have done the whole thing in Setrack. We have lift-off! Up to a point anyway. I solved my baseboard support problem for now with old VHS videos, so this running session is brought to you by (among others) the Blues Brothers, Monty Python and Ivor the Engine, with additional support from Mike Sharman's "Wheel Standards" book to level things up. (Only people who have heard of Flexichas will appreciate the irony). Good news - all the electrics work (even the cattle dock, I had wired the frog feed wrong). 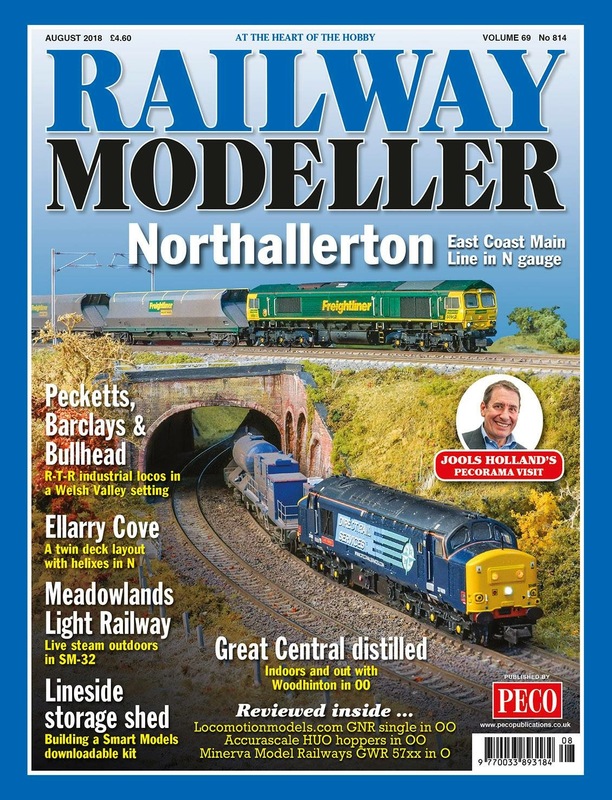 I have run my Class 26 and Pannier over all sections with no derailments or nasty lurches. And the Finetrax looks gorgeous, even unballasted. Bad news - my oh-so-clever point operating mechanisms are not so clever. Two work fine, one works when it feels like it and the other two are just decorative. Back to the drawing board - thicker piano wire or a complete redesign? I just love what you've done Richard. Finetrax looks fantastic. To be honest if you ignore the couplings, you can't tell what scale it is from your photos. It's just great. Well done mate, keep at it. First ever passenger train prepares to depart from Longframlington - possibly a special for Rothbury Races, as motive power is Haymarket's D5307, which makes it at least ten years after the branch closed to regular passenger services. More bad news - my uncoupling magnets don't work properly either. I'd forgotten why I abandoned MicroTrains knuckles in favour of my own design coupler. I'm starting to remember. But even so - I HAVE A LAYOUT AGAIN! Thanks very much, glad you like it. Finetrax has been around a while now, so I'm puzzled there aren't more layouts using it. 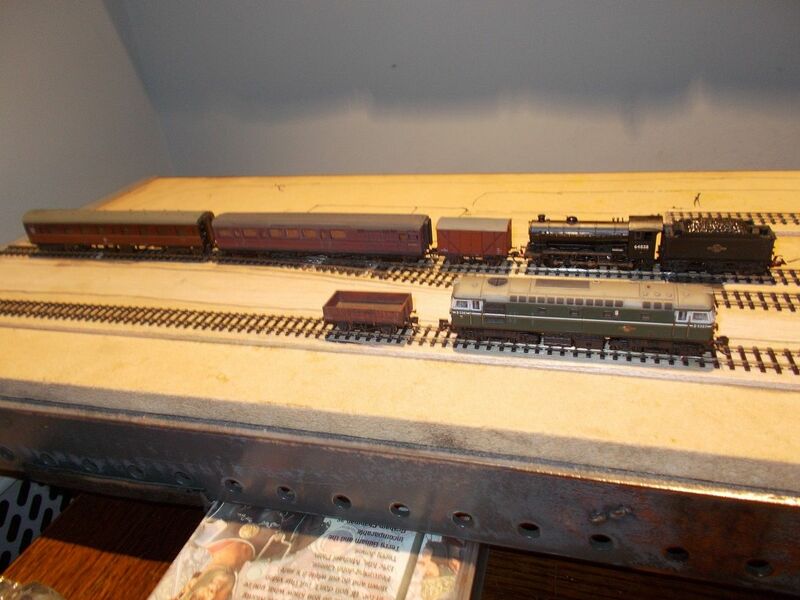 I'm impressed how smoothly my stock runs through the pointwork, although back to back setting is now critical - I have several wagons in the "sin bin" awaiting attention, mostly with older wheelsets. My K1 on its Seventies vintage Farish chassis nearly copes but not quite. With a bit of fiddling it might actually work which would be great. Later the same day - D5307 having failed has been dumped in the goods siding, with 64838 summoned from beyond the grave (scrapped two years earlier at Doncaster) to work the afternoon train. I really need to get round to renumbering that one. As I type this the J39 is being thoroughly investigated by a large housefly. 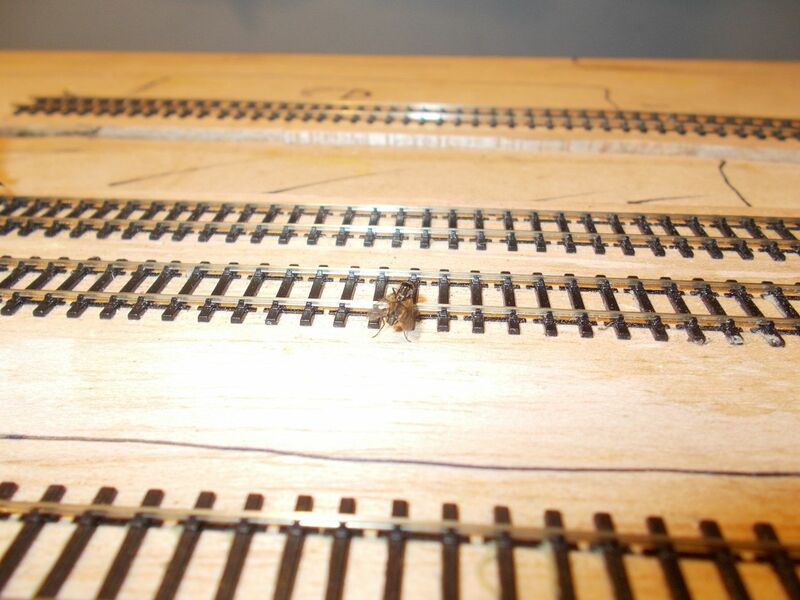 This is possibly the most unsettling thing I have seen in N gauge. It was in the cab at one point, checked out the rest of the train and also the track. Rivet counting flies, just what I need now. 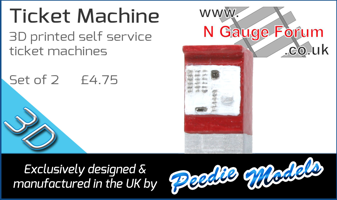 Thanks for kind comments, hopefully we will start seeing more Finetrax layouts soon. 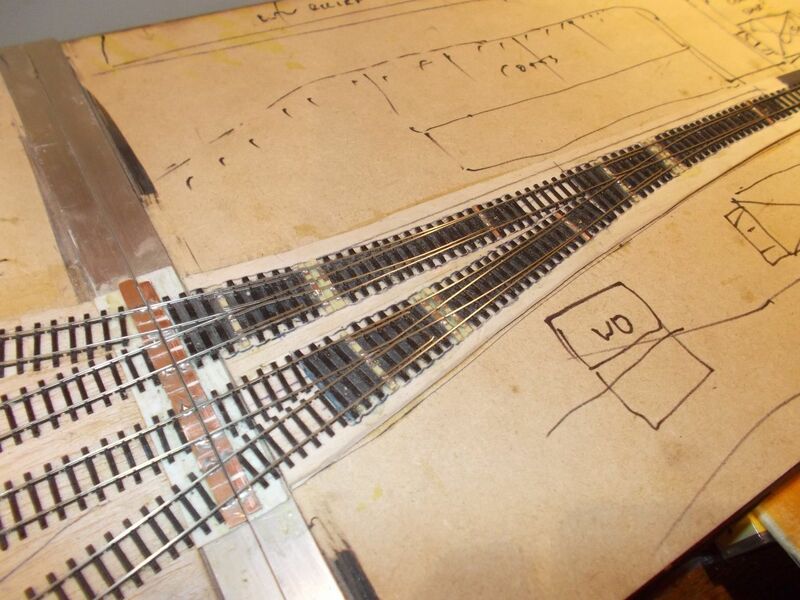 Don't expect too much visible progress on this one for a while: unlike my last layout I'm not even going to start ballasting or scenics until I have it running 100% reliably (apart from a couple of test sections of ballasting in the fiddle yard to try out different techniques). I have found another check rail that is a bit tight for comfort, and after talking to some of the 2mm folk I want to put expansion gaps in a couple of places where changes in temperature might cause problems. Most of it is OK, it's just the loop roads where the rails don't have any room to expand or contract. I also want to build some little mini-trestles to raise the boards about a foot off the table, so I can get to stuff underneath without having to turn the layout over. Just a quick question...what are using to join lengths of track? I ask because friends at our club who are building a p4 model use the tiniest fishplates ever...with moulded on boltheads. Prodused at both insulated and conducting. Presumably there arent anything equivalent at 2mil ? BTW, that fly would send one of my three year olds in to meltdown, as much as she likes rains, she hates flies! That's what I was discussing with 2mm Assoc members (fishplates, not flies). I didn't think the plastic track base would be strong enough to hold the rails in alignment without soldering brass wire across the joints, but apparently others have had no problems with leaving the rail ends unsupported using Easitrac, which is thin plastic base like Finetrax. I think Wayne at Finetrax was looking at getting some fishplates made. Yep, they are a world unto themselve the p4 brigade. But I have to say I am less scathing than I was, I have a reluctant admiration for their skills. 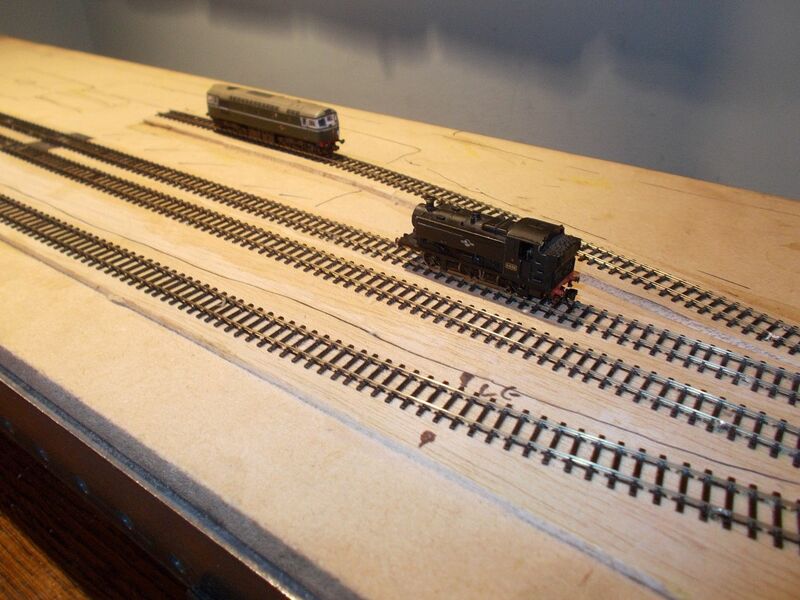 I've done a little bit of tracklaying with both Easitrtack and Finetrax (not on the same line, obviously!). The 2mm Association sells Easitrack glue (a bit like PVA) which seems to work well - it needs a while before it hardens, which allows some adjustment, but I don't remember a big problem with fumes. The 2mm folks also have brass cast sleepers and chairs to stiffen the rail ends at baseboard joints (they need gapping to prevent short circuit). I haven't used any yet, but they seem like a good idea. 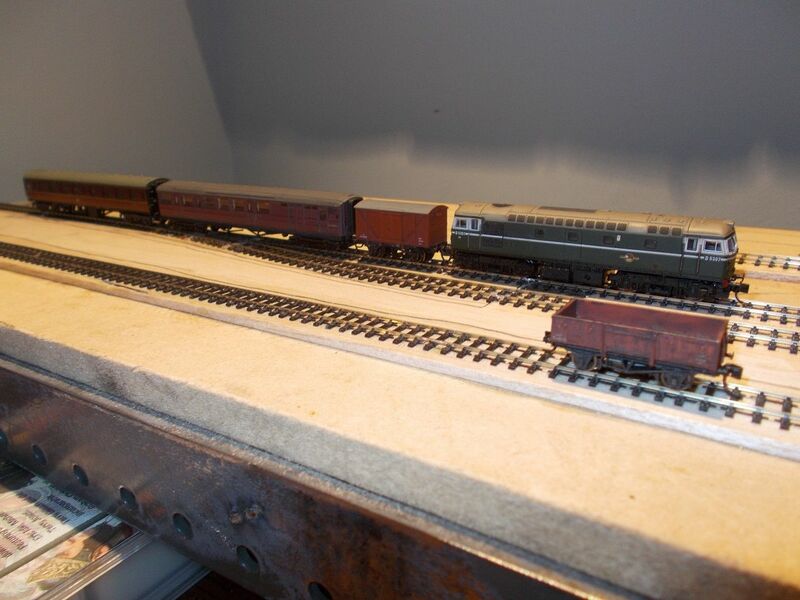 Next time I lay some Easitrack/Finetrax, I plan to glue the sleepers with only one rail in place, so as to get a smoother alignment, especially for curves. Whenever I put in a second rail, it seems to interfere with the sleeper spacing and using the supplied jig only helps for two 6 x sleeper lengths (and only works for straight lengths anyway).